The turnout in B.C. is estimated to be 57.8 %. @keithbaldrey @DrRaymondMc Your math is right. Turnout was 57.8 per cent of registered voters. Will be lower for eligible voters, though. Vancouver-Quilchena’s voting results in 2009 were 70.22% Liberals (Colin Hansen), 9.04% Green Party (Laura-Leah Shaw) and 20.74% NDP (James Young). 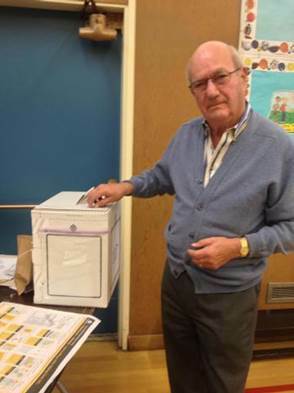 The voter turnout in Quilchena was 57.67%, higher than the average provincial turnout of 50.99%. Quilchena’s new MLA Andrew Wilkinson did not provide a current statement, but he spoke with Global BC’s Jas Johal during the election night of May 14/15. Nicholas Scapillati said he was very happy with the results of over 25 per cent of the popular vote, considering it was a difficult riding to win in. His main challenge? The public debates, in which he had to perform against seasoned politicians. All in all, the political episode was a positive experience for Scapillati. “I hope to be a candidate again somewhere, some day,” he said. Until then, he will return to his regular job. “People don’t realize that all candidates, other than existing MLA’s, are volunteers,” he said. “All of us either took a break or leaves or gathered our vacation time from our jobs and be part of something that we thought was important in the community. So now I am no longer a volunteer and I am back at my job [as executive director] at Farm Folk City Folk. 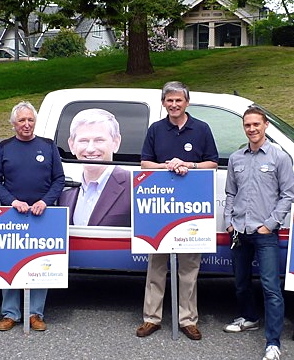 Congrats to @Vote4Wilkinson & to @dkettlewell & @BillClarke4MLA on running respectful local campaigns. It was an honour to run against them. “If we didn’t have Andrew [Weaver] in the house, I think I would be more concerned . . . Maybe those folks that are being born today will be the ones that will evoke change in the future and allow for us to have a Green MLA in Quilchena one day,” Kettlewell said. Kettlewell will focuson his young family in the summer, and is optimistic about B.C.’s environmental future. “The people of B.C. have a strong history of activism in the community and the people of B.C. and Vancouver will not allow for environmental destruction,” he said, adding he would be surprised if the additional Kinder Morgan pipeline were to happen. Rick Peterson, Vancouver campaign manager for Bill Clarke, congratulated the BC Liberals on their victory in his May 15 press release, but didn’t hide his disappointment. Bill Clarke ended the election night with a hand-written thank-you note to each and every campaign helper. This entry was posted in Dunbar, Kerrisdale, Musqueam, Politics and tagged Andrew Wilkinson, BC elections 2013, Bill Clarke, Damian Kettlewell, Elections BC final results, Katja De Bock, Nicholas Scapillati, Rick Peterson, Riding of Vancouver-Quilchena, Vancouver-Quilchena by westsidebeat. Bookmark the permalink. Were people surprised by the result in this area? I like the edition of the Tweets in your article. I can’t add those on my blog. yes, the tweet function is cute. Richard H. showed me how to do it. I would say people here were not surprised, as the Liberals have always won in this riding. I do think that it is remarkable that the NDP candidate Nicholas Scapillati scored 25%. He was the only political newcomer of all four candidates, after all. We also have a better turnout than the rest of the province, with 60.1%. I don’t know why. I was told there will be a more detailed, poll-by-poll, stat coming out sometime in June. It will be interesting to see how Dunbar voted versus Kerrisdale, Musqueam, Shaughnessy etc.